I want to take you to a special place. Janne and I have spent there over 20 days by now. And every day of exploration rewards us with more finds. It is nearby. An old friend. But did we know all of its secrets before? I certainly didn't. Caves in Finland are small. 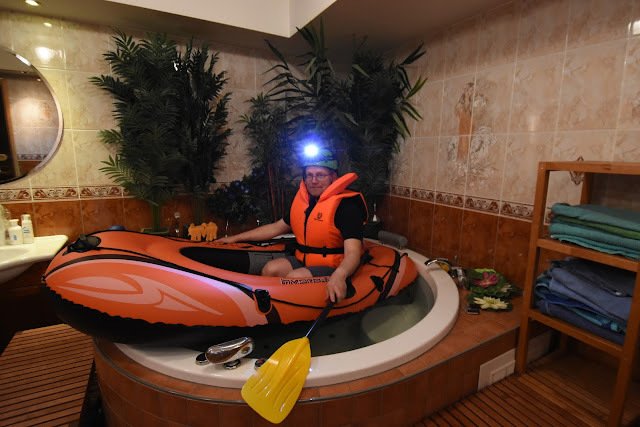 What if I told you about a complex system of caves, with hundreds of meters of tunnels and fifty entrances, including one that you can drive a boat in? A cave with so tight turns and complex intersections that I've become confused where I was. Not to mention gotten stuck several times. I have given this cave a nickname, Dragon's Cave, due to what its digital model looks like. But it is difficult to grasp the full extent of the cave. I don't know for sure, but it is likely that people have visited most parts of the cave. The biggest hall is a popular hiking destination on weekends. 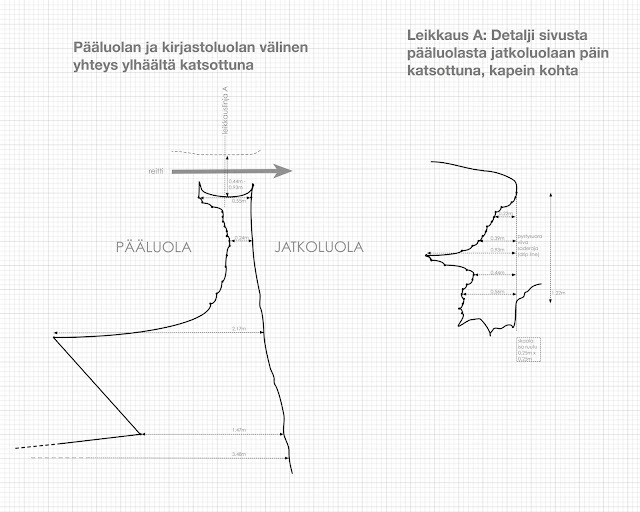 The cave can be found from, for instance, the Retkipaikka web site. 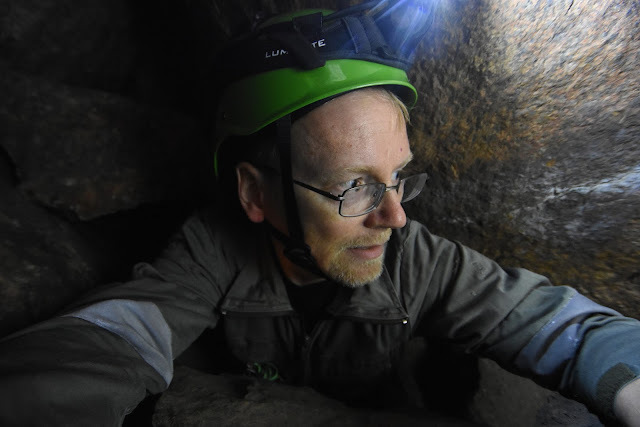 But before you get too excited, I need to say that this cave is difficult to classify or measure. It is a matter of opinion whether it can be considered one cave or a set of disconnected caves. The cave runs under rock roofs open to the side in several places. The places get light and feel open, even though they are technically under rock. And you're well beyond the dry side of the drip line if it rains. It is also difficult to figure out how various short side passages should be counted in the cave's length or be drawn in the map. 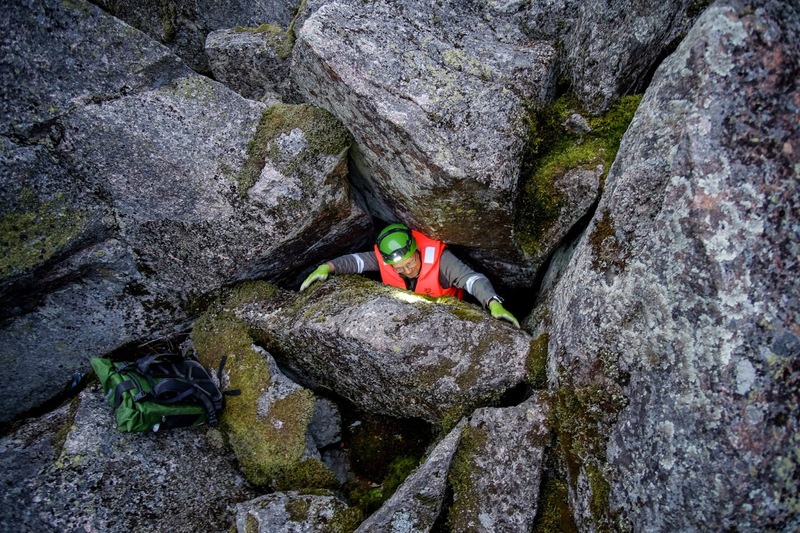 To generalise a little bit, Nordic boulder caves are difficult to survey, difficult to draw a map of, or measure. What kind of a map would you draw from a pile of rocks? And Korkberget is exactly that, a pile of rocks. 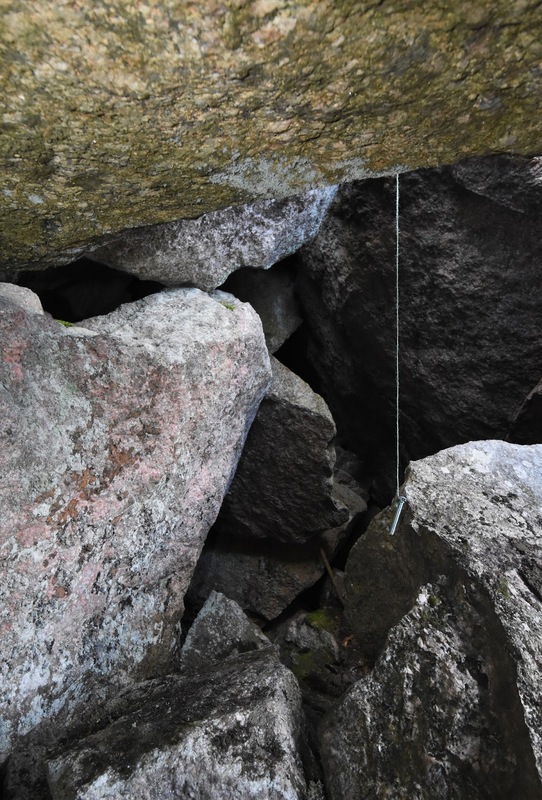 Even if it is a big pile of rocks, from a collapse of a 35-meter (100 ft) cliff, with the largest boulders reaching 10 meters (30 ft) across. 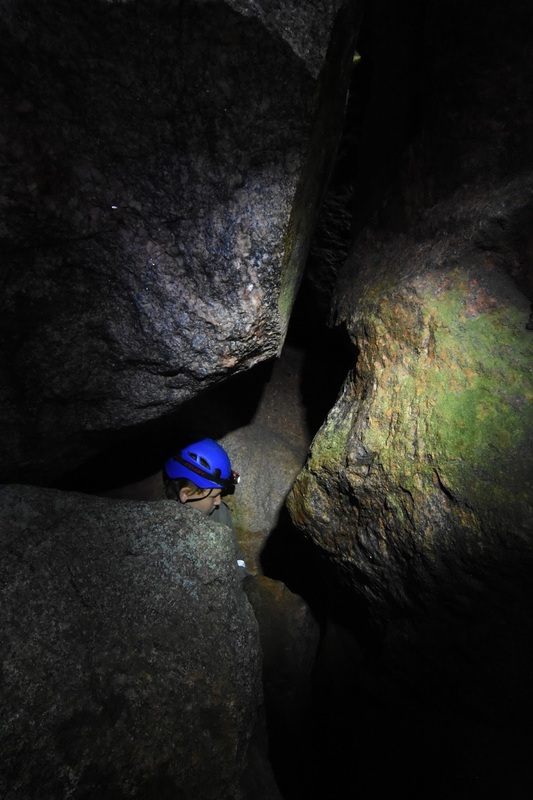 Boulder caves are relatively rare form of caves world-wide, so we have to figure out how to represent them. 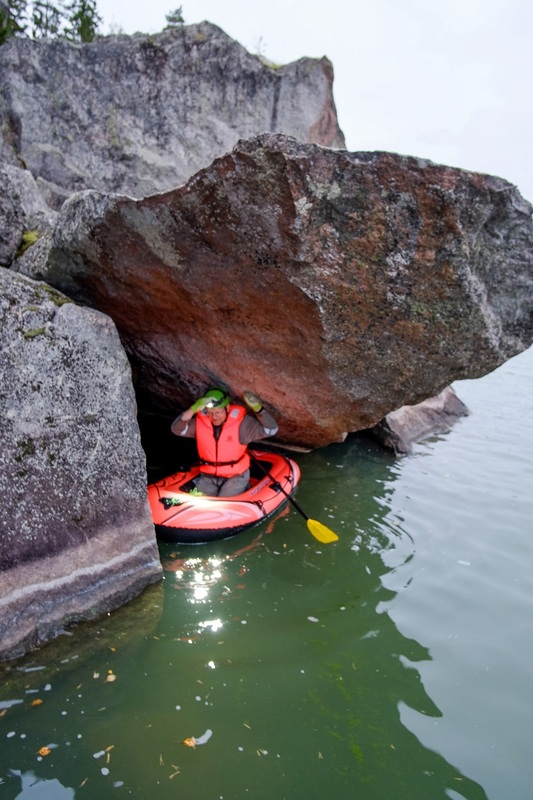 One of the problems is that there are often a large number of routes, between and under the rocks. And a large number of entrances, with light being visible from inside the cave in several places. The cave passages have often chaotic forms in these caves. 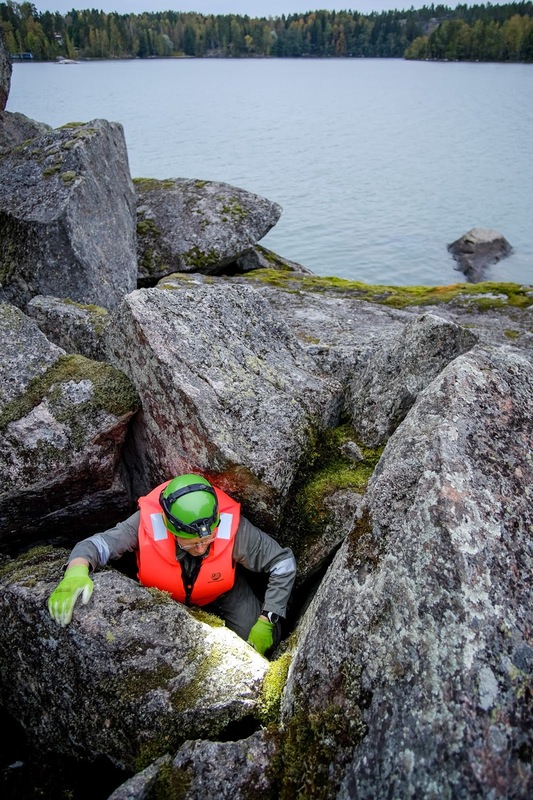 Due to the fractured and piled rock, a passage may at some point be just wide enough to let you through but ten centimeters forward it widens to several meters, and then again into some other width. And each of those changes may be different at different levels. Your eyes may see a very different cave than there is at your feet level, for intance. It becomes difficult to find routes, because you may not see an opening right next to you. I had found a T-intersection in the cave, and had visited this intersection many times -- for several weeks -- until I realised that there's also passages going up and down in the same intersection. How can one be so blind? The cave has one large hall, but other parts consist mainly of small cracks and passages. Some of those passages are extremely small and have sharp edges. In the latest count I found over 20 bruises in my body from the caving. The cave is mostly dry, but as one gets closer to the lake Humaljärvi level, the passages turn into partly water-filled, algae-infested, smelly, and dusty places. 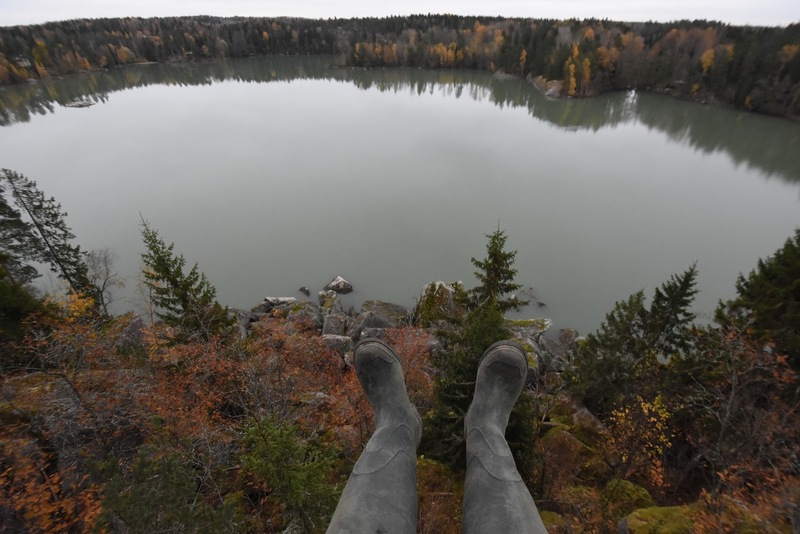 Some parts can only be explored with wading boots. 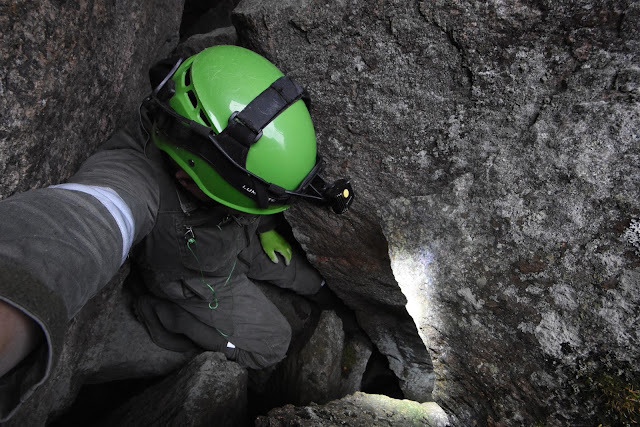 And the cave is so tight that I had decided to leave cellphone out of my pocket while caving. Even my thin phone would complicate the progress through the passages. Several people -- me included -- have also gotten stuck into the cave a number of times. Temporarily. It has been very interesting to explore a place for which no map existed. The target of this exploration was near, just a few kilometers from my office. It wasn't a mountain on the other side of the world but rather a small pile of rocks. But it is still interesting. I wonder how many other small places are waiting to be explored more fully in our environment? For instance, there are many other boulder fields and caves in Finland. I should also say that our explorations of Korkberget are by no means complete. We've just started, and the map has a number of question marks and areas that would need further work. I have also made a video of going through one of the main routes through the cave. Even though this the easiest part of the cave and the video shows only 175 meters of passages, it still takes 45 minutes to go through. The video is speeded up 5X, but should give you an idea of the cave. In the video you'll see counters for both the elapsed time and explored distance, as the video has been linked to the digital cave model. There's also a slightly slower, 3X speeded up video. Korkberget cave consists of eight parts that we have named (perhaps slightly boringly) as Pääluola (main cave), Kirjastoluola (library cave), Yläluola (upper cave), Sivuluola (side cave), Onnenlohkareluola (lucky boulder cave), Vasuriluola (leftie cave), Takalippaluola (back lid cave), and Nenieteluola (this is the last part and the English translation would be "ecnartne" or the reverse of "entrance"). The various halls and passages have names as well. Like the imaginatively named Sivuhaaran Alahaara (lower passage of the side passage). But for instance, in the library cave there's a Lehtisali (magazine reading room) hall with somebody's newspaper from 1994 on the floor. 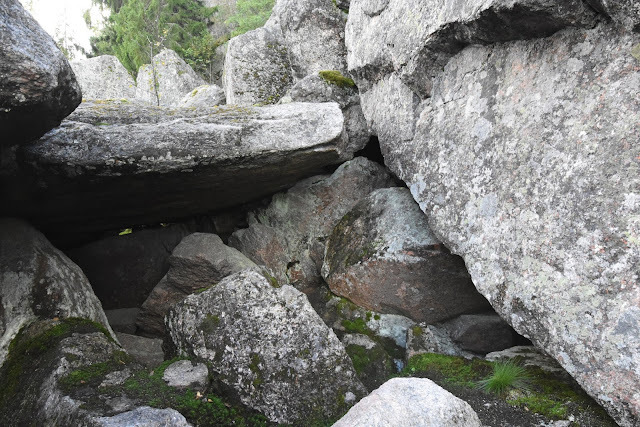 To exit the library cave you'll take Lohkareliukumäki (sharp boulder slide), where the name is an indication that the path is not easy. The entrance from the lake is via the Venevaja (boat house) passage. 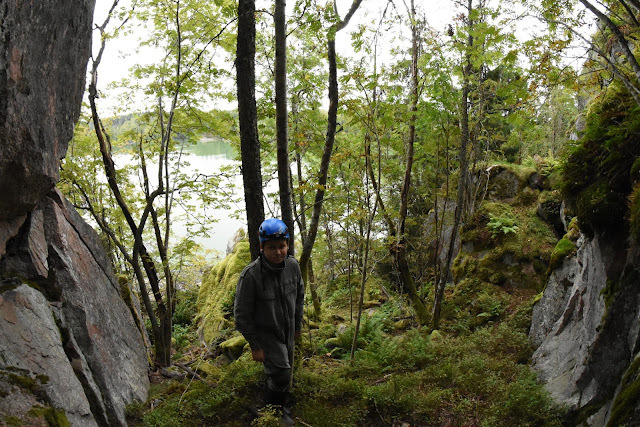 The path that we found from the main cave towards the boat house is called Tie Tuonpuoleiseen (road to the afterlife). And the wet, smelly and boringly named Allas 2 (pool two) passage leads to drier and more interesting Salaisuus (secret) hall. 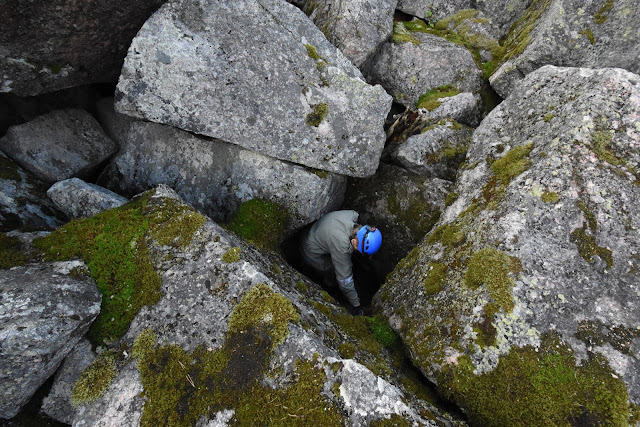 And there's also Luolaseuran Reikä (Cave Society's hole), named after visiting friends from the caving society promptly went through this very narrow crack that Janne and I still today have not dare to enter. The cave has at least 50 entrances, whose GPS coordinates are in the map. But the accuracy of the GPS is not quite enough for locations so close to each other. 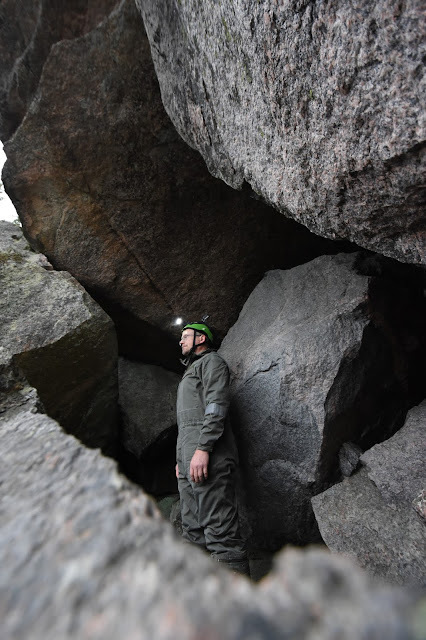 The cave is within a 20 meters by 45 meters area of boulders. Same or different cave? You decide! 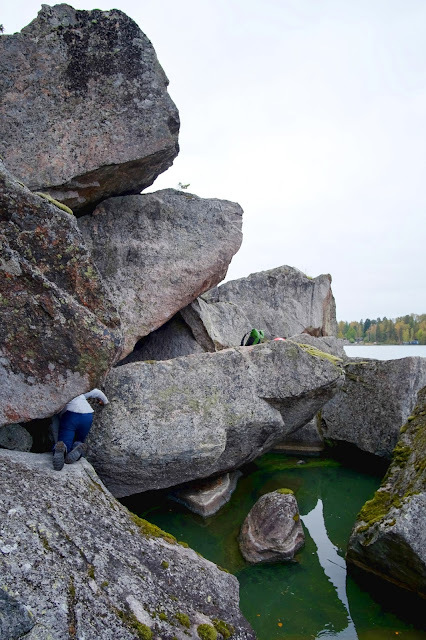 The Pääluola and Yläluola are connected by a very tight route where one has to turn sharply to avoid getting out from under the rock roof. Janne was the first one to succeed in going through this path, though I have also done it later. After the turn one has to stay under the small rock roof around a hole that is open to to the sky. After this the darker and deeper cave passages of the Yläluola begin. Same or different cave? Again, you decide. OK, BUT HOW LONG IS THE CAVE? The map and the digital model show also some parts that we have not (yet at least) succeeded in going through. There are also side passages that may be too small to count. And including the Takalippa part might be questionable. If all of these parts are removed, the total length of cave passages is about 300 meters. But this number is based on the assumption that one can count everything to the cave as long as a man can go through and there's a roof above. But there are other and maybe more reasonable assumptions. 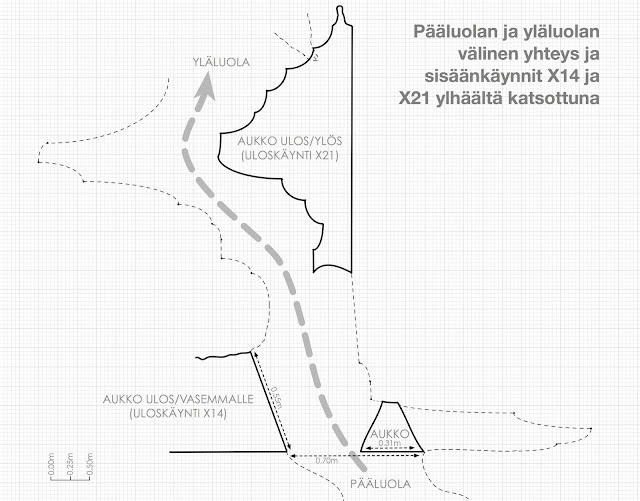 If the Yläluola is considered as a separate cave, then the remaining part is 269 meters. If Nenieteluola and other parts behind the big lid are taken out, we are left with 237 meters. 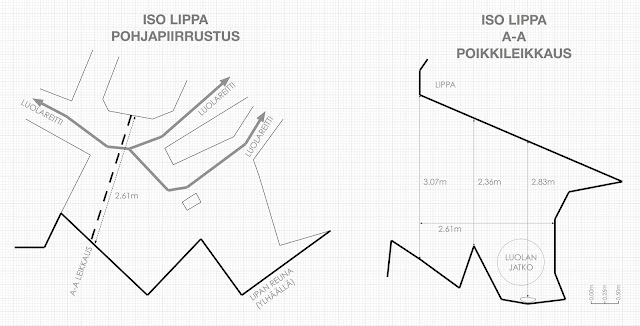 And finally, if even the Kirjastoluola is taken out, only 178 meters remain. The numbers are therefore very different according to what you interprete as the cave. But the cave itself offers no intepretations, it just is. 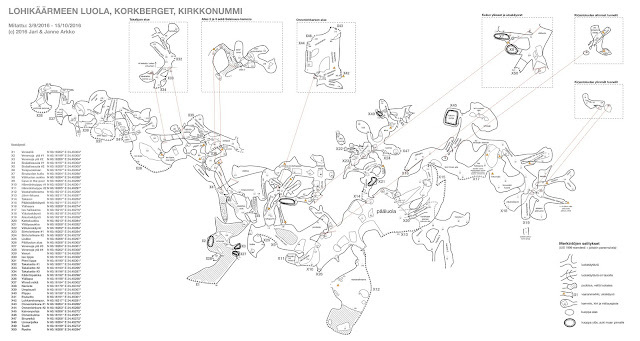 My purpose is to just explain accurately what there is in Korkberget, and leave the interpretation to others. But it is clear that the cave or set of caves here is sizable among Finnish caves. The vertical difference between the water level and the highest part of the cave is 9 meters. Simple caves can be surveyed by taking the length and width, and drawing map. Larger caves have traditionally been surveyed with the tape-compass-inclinometer method. In this cave we have, however, applied advanced laser measurement technology. 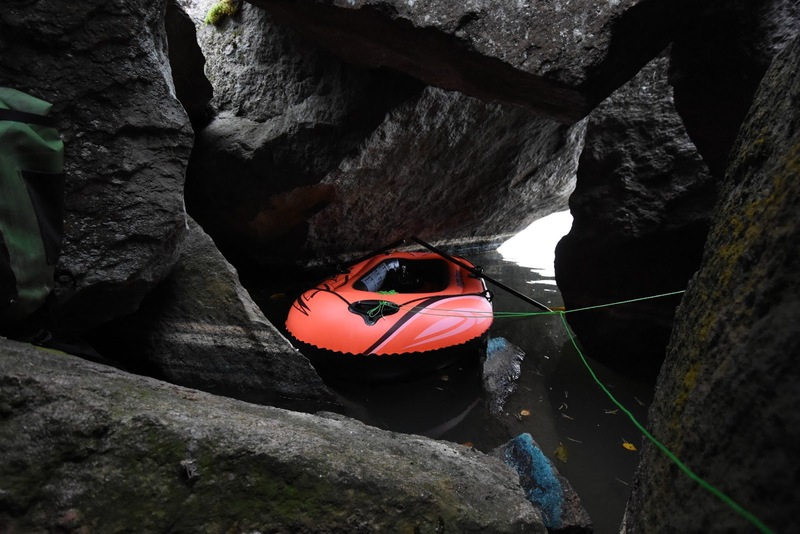 There are no commercial tools for this purpose, but Swiss cave hackers have developed alternative electronics for a commercial laser distance measurement tool. 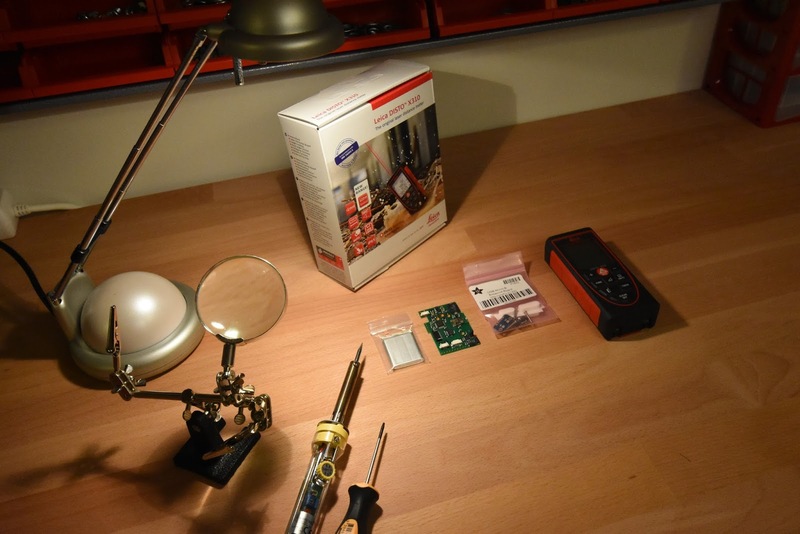 The hacked tool can measure not just distances but also inclination and compass readings, and transfer data wirelessly. The basic idea in the surveying is to go from one measurement point to another, and take readings of the distances and directions between the points. A measurement point may for instance be a rock on the floor of cave passage. The starting point of the measurement is at an entrance whose location is known through GPS. GPS does not work under ground, but with the distance and direction measurements you can calculate where you are. Some people are even carrying a tablet with them to do this in real-time. The measurements help you draw a digital 3D model of the cave. Such a model helps you navigate through a cave and lets you, for instance, see if there's a possible connection between two nearby cave passages. The base for the hacked device is a Leica Disto X310 laser measurement tool. In addition you'll need a new non-ferromagnetic battery, a new motherboard, and replacement parts for all other metallic parts (screws etc). The costs for the device without shipping is around 500€. More information about this tool can be found from http://paperless.bheeb.ch. 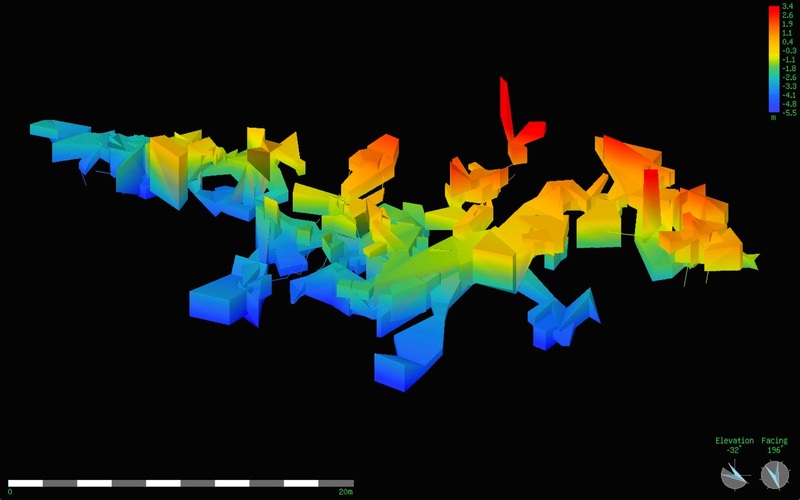 A digital model is by itself usually insufficient for drawing a high-quality, readable map. It is best used a base for manually drawn map, where all the relevant practical information can be incorporated into the map. Still, even viewing the map in traditional paper form can be difficult. Caves are 3D, paper is 2D. The Korkberget cave runs on three different levels in some places, for instance. 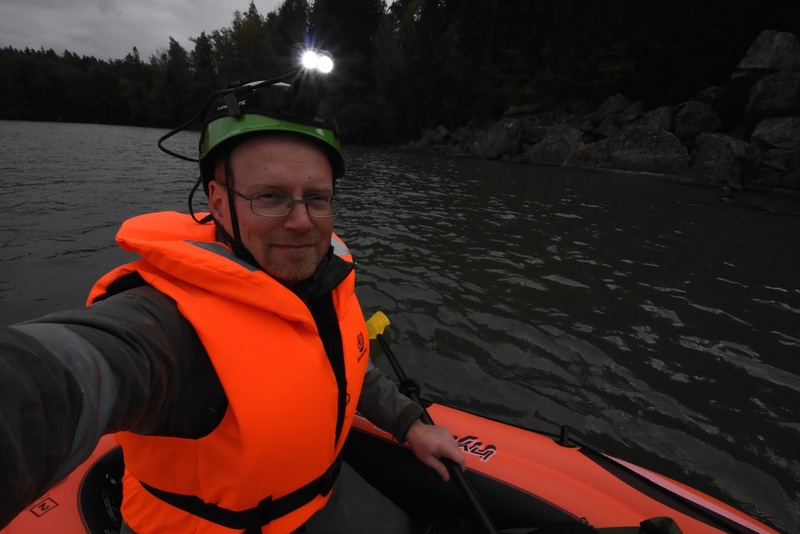 I should also say that all our measurements are preliminary, our equipment has not been calibrated, our technique lacking, and I also realised quite late that I had a magnet in the locking mechanism for my helmet and that may have disturbed some of the measurements. There is also more to explore. 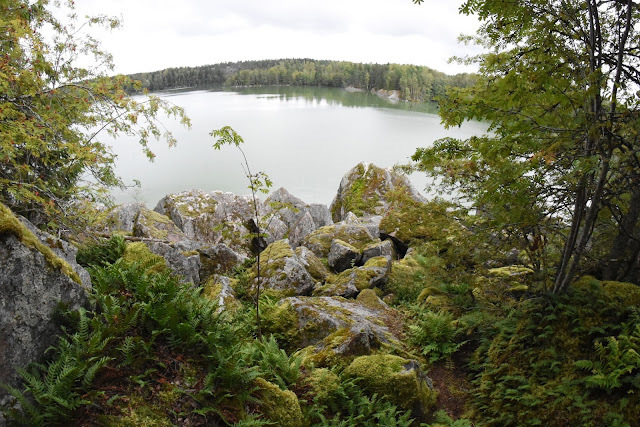 For instance, at the Alasisäänkäynti (lower entrance) of the Kirjastoluola the cave continues forward towards the lake. You need to pop out of the cave and you'll be under the sky for a meter, but you also also in a deep pit with rock all around you, so I'm not sure if this should count as a disconnect in the cave or not. In any case, we'll get to look at this next summer when the ice and snow has melted. The full map of the cave is here. The full survex model file can be found here. The Survex software can be downloaded from here. In our case, the Survex file itself has been automatically generated from a new description language "Cave Form" that I developed. The source file for this description of the Korkberget cave can be found here, and the necessary CavForm2Survex software here. The map for human consumption was drawn with Apple's Graphic-application. The work on the map started, however, with an SVG file generated from the Survex model. This ensures that the cave parts are in the right place and of the correct length. To generate the suitable SVG files you will need my small changes to the Survex software. These changes can be downloaded from here. The changes are to Survex version debian-1.2.30-1. Unfortunately, the changes are for now horrible hacks and in need of several rounds of rewrites before they are usable for other people. The entrance to the big hall part of the Korkberget cave is in the coordinates N 60.16211° E 24.45271° (google). The cave is roughly a kilometer's walk from the road. The trail head is at Kirkkotie 68, Kirkkonummi. The trail takes you to a boat harbour on lake Humaljärvi. 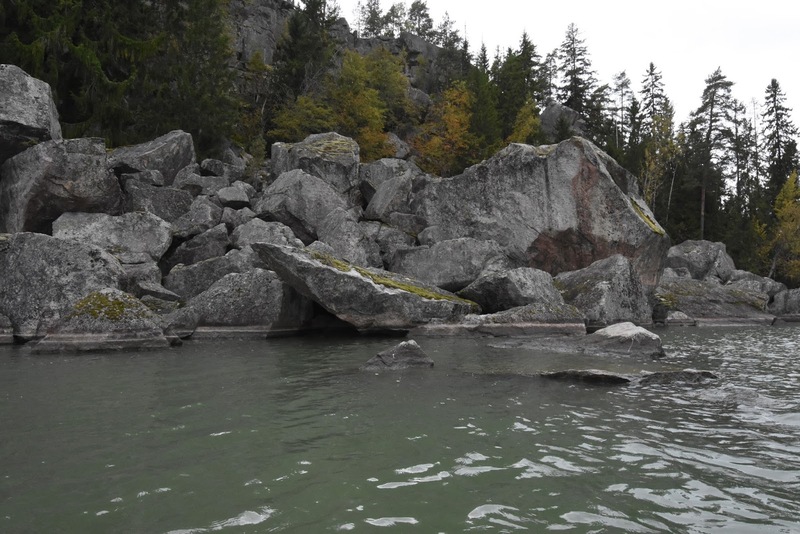 Once you reach the cave turn left and follow the shoreline to Korkberget. There is parking space for couple of cars on the road, near this point. But: Korkberget is a not a family picnic destination! It is relatively easy to visit the main hall, but the even the walk there requires some climbing on boulders, ability to walk safely on cliff areas, and preferrably good weather. Be careful! The main hall is best reached by following the trail, and once you reach the cliffs, stay close to the bottom of the cliff, i.e., walk between the cliff and the boulder field. 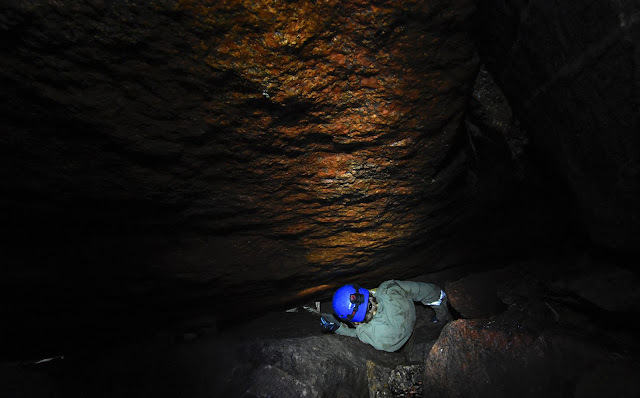 Twenty meters before reaching the coordinates the cave, move to boulders and walk on them to reach the big hall area. The other parts of the cave are quite challenging, so be particularly careful there. And never go alone. Some parts require climbing experience. The vertical and tights parts may be dangerous. 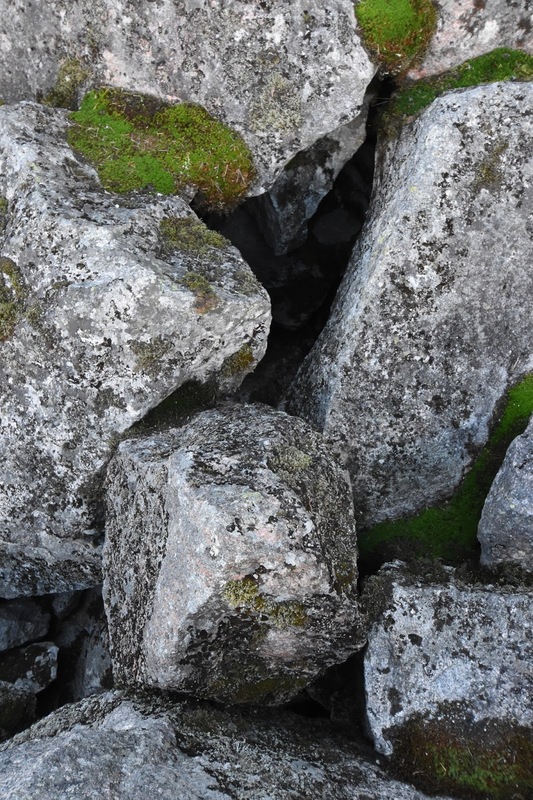 There are also areas with potentially moving rocks that may fall on you. In particular, the tight passage from Vasuriluola (leftie cave) towards Ylälippa (upper lid) is unstable and dangerous. There is a real possibility of getting stuck in that passage as well as in Piippu (chimney), Takaportti (backgate), Puristus (pressure), Väliluolan haara (middlecave branch), Luolaseuran reikä (cave society hole), Lisäke (appendix), Liukumäki (slide), Kanjoni (canyon), Alusta (base) and the anywhere in the Onnenlohkare (lucky boulder cave) area. The same is true of everywhere where we have not succeeded in going through yet, such as in the passage Levä (algae) or passages beyond Kirjastoluolan eteinen (library cave entrance hall). All of these passages are difficult to move in, usually it takes time to figure out the proper posture to move forward. So please practice basic caving elsewhere first, and get good equipment before visiting this cave! Outside the main cave hall you'll need at least overalls, helmet, headlamp, and gloves. 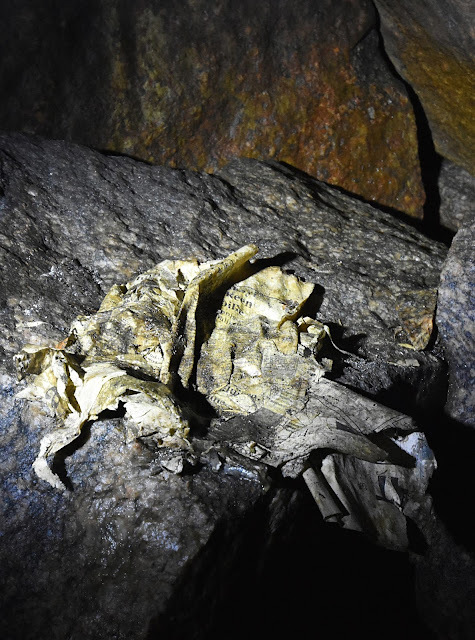 Please remember to not leave any rubbish or marks in the cave or the path leading to it! 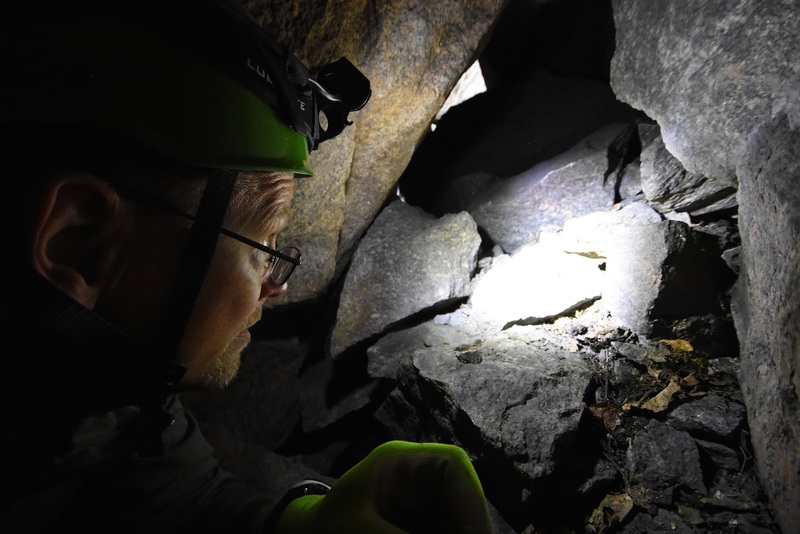 The cavers who spent most of the time in the cave were Jari Arkko ja Janne Arkko, but we've also had visits from Jarmo Ruuth, Eetu Ruuth, Eino Ruuth, Tor Paulin, Dare Talvitie, Taina Nyman and Mika Ahvenniemi. We were at the cave for the first time in February 2016, but came back to look at it again in August on Janne's request. We got so excited about what we saw that we spent most of our free time between August and October there. I would also like to thank Tor Paulin and Beat Heeb for their help in building the surveying device. Here are some additional photos from the cave. Photos and vides (c) 2016 by Jari Arkko, Janne Arkko ja Jarmo Ruuth. This blog is also available from TGR. Tämä blogi löytyy myös suomeksi Relaasta.